On the evening of October 20th, masked guests descended upon Fred Wildlife Refuge in Capitol Hill for AIGA Seattle’s 2016 Annual Membership Party and Fellow Award Ceremony. 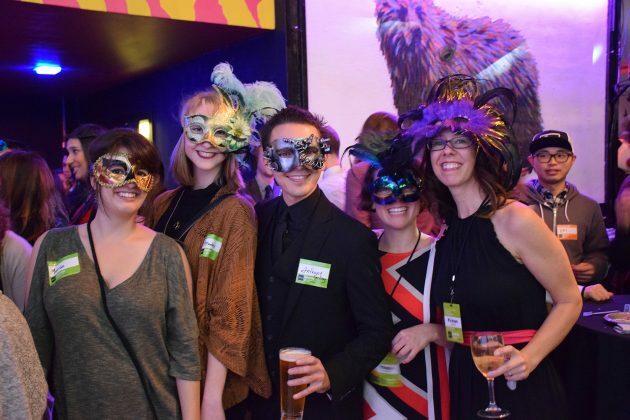 The event’s masquerade theme served as a playful backdrop to reflect on another year of AIGA Seattle’s amazing programs, events, and professional development opportunities, and to thank our membership base and volunteers who help make it all possible. After some mingling, dining and drinking, AIGA Seattle President Brendan Shanley gave the annual State of the Chapter update followed by the highly anticipated presentation of the 2016 AIGA Fellow Award recipients. 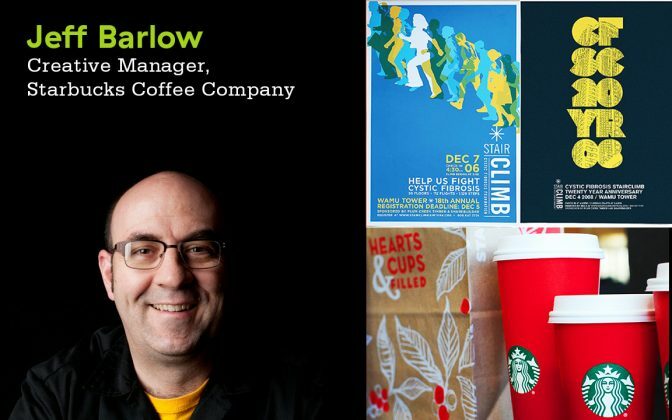 This year AIGA Seattle honored two accomplished designers: Jeff Barlow, Creative Manager at Starbucks, and Tony Gable, founder of Gable Design Group, who passed away in May of this year. Nominated by their peers, the AIGA Fellow Award is our chapter’s highest honor. 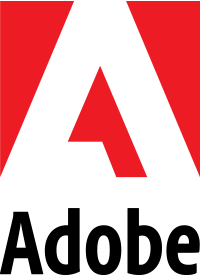 It recognizes seasoned design professionals who have demonstrated significant contributions to elevating the standards of excellence in practice and conduct within our region’s design community and local AIGA chapter. 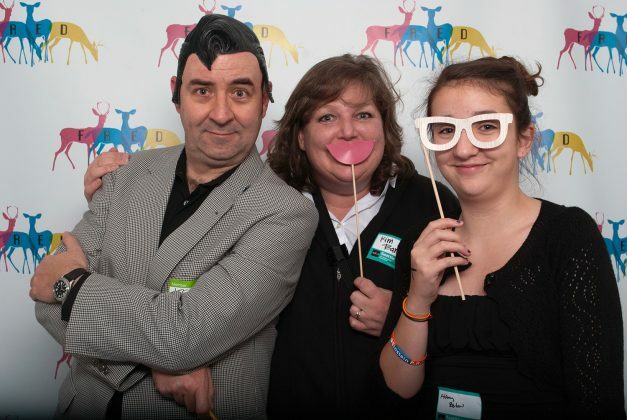 An active member of AIGA Seattle, Jeff served as AIGA Seattle President from 2008-2010. During his tenure he launched Because of AIGA, a website that collects stories from designers across the country who have benefitted from their experience with AIGA. He also helped start AIGA’s first Alaskan Chapter in Anchorage. Finally, Jeff continues to play a significant programming/producing role for Into the Woods, AIGA Seattle’s bi-annual design retreat. Tony Gable (1951-2016) was a unique hybrid of graphic designer and musician. He was the first African American graduate of the Seattle Central Community College Graphic Design program in the 1970s during which time he also founded a funk band called Cold, Bold and Together featuring a then unknown sax player named Kenny G. Initially, Tony’s music career helped finance his dream of starting his own graphic design studio, Gable Design Group, which he launched in 1985 and proceeded to forge his reputation as a designer with great integrity, talent and compassion. As his firm grew, Tony acted as much as a mentor and teacher as he did an employer. 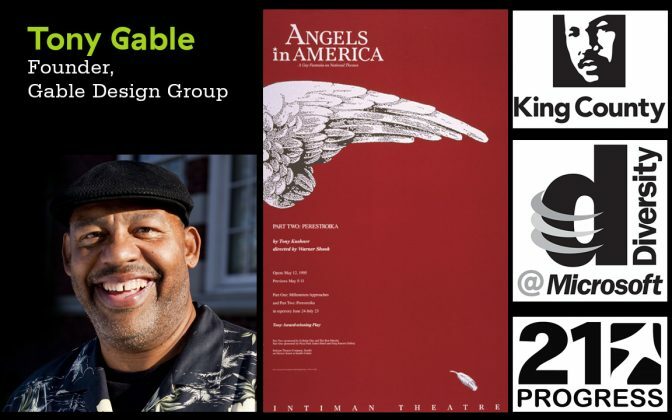 Gable Design Group hired many interns and graduates fresh out of college, often giving them their first chance to work on a wide range of high visibility projects early in their design careers. 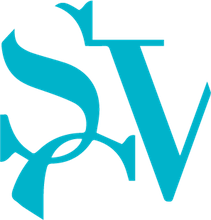 In 2006, Gable Design Group won a highly competitive contract to redesign Washington’s King County logo, beating out a field of nearly 30 local and out-of-state firms. When asked what this project meant to him Tony said, “My beliefs were shaped by the civil rights movement and other injustices from our time… I never dreamed I would be tapped for such an historic assignment.” Some of Tony’s other accolades include receiving the Art Institute of Seattle’s Gold Compass Award for his years of mentoring students, Seattle's Media Inc.'s Design Person of the Year, and the mayor's Small Business Award. He also served on the boards of AIGA Seattle and HOW Magazine. This year, King County issued a proclamation designating October 12, Tony’s birthday, as a day to remember his life and accomplishments. As always, it was a great evening honoring AIGA Seattle’s newest Fellow Award recipients, meeting friends old and new, and growing AIGA Seattle’s network of supporters committed to enhancing and advocating for our region’s design professionals. Congrats to our new Fellows, and to the lucky winners of the amazing membership party raffle prizes including a one-year Adobe Creative Cloud subscription ($599 value), a three-month, 350/image per month Shutterstock standard license subscription ($597 value), and a tour and tasting for 10-15 people from Captive Spirits Distilling ($150 value). Finally, a HUGE THANKS to our loyal members, sponsors, and volunteers! We look forward to offering you another year of professional programs, development opportunities, networking events, and much more.